Valerio de Campo at Gorizia pre-war. Valerio de Campo was born on 24 April 1914. In 1935, he attended the pilot schools in Cameri and in Malpensa. De Campo was commissioned (in Servizio Permanente Effettivo) on 1 February 1936. With the rank of Sottotenente, he was assigned to the 84a Squadriglia, 4o Stormo at Gorizia in 1936. He volunteered for service during the Spanish Civil War, where he served in the 32a Squadriglia during April to November 1937. Valerio De Campo in Spain 1937. He was then promoted to Tenente and awarded a Medaglia di bronzo al valor militare. However, it seems that he was back in the 73a Squadriglia in June 1939 since being a highly regarded aerobatic pilot, he took part in the Staaken/Berlin air show with this unit during this month. In May 1940, he married Liliana di Manzano. The 73a Squadriglia included Tenente Vittorio Pezzè (CO), Tenente De Campo, Tenente Giulio Reiner, Tenente Pietro Bonfatti (assigned in the end of July), Sottotenente Giuseppe Oblach, Sottotenente Carlo Battaglia, Sottotenente Alvaro Querci, Maresciallo Mario Ruffilli, Maresciallo Alberto Montanari, Maresciallo Norino Renzi, Maresciallo Corrado Ranieri, Sergente Maggiore Guglielmo Biffani, Sergente Maggiore Enrico Dallari, Sergente Maggiore Sergio Stauble, Sergente Maggiore Antonio Valle, Sergente Santo Gino, Sergente Lido Poli, Sergente Pasquale Rossi, Sergente Mario Guerci (still in training) and Sergente Armando Matacena (still in training). Participating pilots were Romagnoli, Capitano Giuseppe D’Agostinis (CO 91a Squadriglia), Tenente Enzo Martissa (91a Squadriglia), Sergente Aldo Rosa (91a Squadriglia), Tenente Giovanni Guiducci (CO 90a Squadriglia), Sergente Maggiore Angelo Savini (90a Squadriglia), Capitano Luigi Monti (CO 84aSquadriglia), Tenente Vittorio Pezzè (CO 73a Squadriglia), Tenente De Campo (73a Squadriglia), Sottotenente Carlo Battaglia (73a Squadriglia), Sottotenente Alvaro Querci (73a Squadriglia), Maresciallo Norino Renzi (73a Squadriglia), Sergente Maggiore Enrico Dallari (73a Squadriglia), Sergente Antonio Valle (73a Squadriglia), Sergente Santo Gino (73a Squadriglia) and Sergente Lido Poli (73a Squadriglia). After this combat, morale, particularly among the 9o Gruppo’s pilots suffering their first African experiences, fell considerably. The 73a Squadriglia was considered the top gun unit of 4o Stormo, its pilots (notably among them Enrico Dallari, Renzi, De Campo and Vittorio Pezzè) were mostly part of the last Italian aerobatic team, which had performed with great success in Berlin Staaken on 23 June 1939, in honour of the returning Condor Legion’s pilots. However, this air battle demonstrated clearly, even in a pure biplane dogfight, that good tactics and sound flight discipline, enhanced by R/T communications were better than the pure aerobatic skill. However, despite this heavy beating, operations for the 9o Gruppo restarted the next day. Tenente Vittorio Pezzè left the command of the 73a Squadriglia, 9o Gruppo, on 10 October due to illness to return to Italy the day after and his place was taken by Tenente De Campo. Pezzè never returned to front line duties; his experience was used in the newly formed Scuola Caccia (fighter school) at Gorizia. 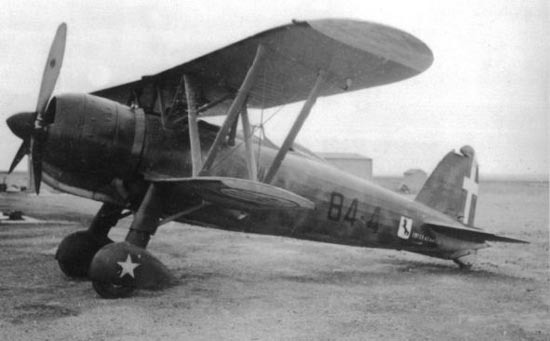 The Italian formation was composed by 18 aircraft from all three Squadriglie of the 9o Gruppo led by Maggiore Ernesto Botto (at the head of the 73a Squadriglia). Six of the CR.42s were from the 96a Squadriglia (Capitano Roberto Fassi leading Tenente Aldo Gon, Sottotenente Carlo Agnelli, Sottotenente Armando Moresi and Sergente Vittorio Pozzati together with 4o Stormo’s adjutant, Capitano Mario Pluda), five were from the 73a Squadriglia (Tenente De Campo, Tenente Pietro Bonfatti, Maresciallo Mario Ruffilli, Sergente Maggiore Antonio Valle and Sergente Santo Gino) and six were from the 97a Squadriglia (Capitano Antonio Larsimont Pergameni, Tenente Ezio Viglione Borghese, Sottotenente Jacopo Frigerio, Maresciallo Rinaldo Damiani, Sergente Francesco Putzu and Sergente Franco Sarasino). They had taken off from El Adem at 14:40 to cover Italian troops in the Bir Enba area (and probably indirectly escorting a reconnaissance plane) when Botto discovered a Bristol Blenheim escorted by several Hurricanes flying lower and attacked. De Campo was promoted to Capitano on 21 November 1940. In the afternoon on 9 December, SM 79s were out to bomb British troops at the Sidi Barrani - Bir Enba area. They were to be escorted by 19 CR.42s of the 9o Gruppo led by Maggiore Ernesto Botto, which had taken off from El Adem at 14:55. The fighters included seven from the 73a Squadriglia (Tenente De Campo (CO), Tenente Giulio Reiner, Sottotenente Alvaro Querci, Sergente Maggiore Guglielmo Biffani, Sergente Maggiore Enrico Dallari, Sergente Maggiore Antonio Valle and Sergente Santo Gino) seven from the 97a Squadriglia (Capitano Antonio Larsimont Pergameni (CO), Tenente Ezio Viglione Borghese, Sottotenente Riccardo Vaccari, Sergente Maggiore Otello Perotti, Sergente Maggiore Massimo Salvatore, Sergente Angelo Golino and Sergente Alcide Leoni) and four from the 96a Squadriglia (Tenente Aldo Gon and Sergente Giuseppe Tomasi together with two unknown pilots). Six CR.42s from the 73a Squadriglia (Tenente De Campo, Tenente Giulio Reiner, Tenente Pietro Bonfatti, Sottotenente Giuseppe Oblach, Sergente Maggiore Sergio Stauble and Sergente Pasquale Rossi) took part. It seems one aircraft from the 96a Squadriglia was lost after the action when Sergente Maggiore Giovanni Gallerani nosed over on landing and his fighters was written off during a clumsy recovery. 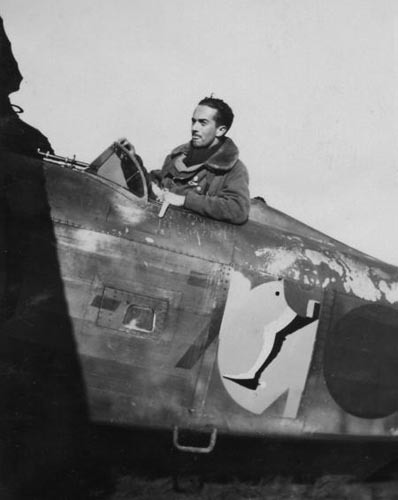 Following the morning’s adventure on 13 December, at 15:05, Capitano Antonio Larsimont Pergameni again led a patrol with four CR.42s from the 97a Squadriglia (Tenente Ezio Viglione Borghese, Sergente Maggiore Raffaele Novelli and Sergente Alcide Leoni), eight from the 73a Squadriglia (Tenente De Campo, Tenente Pietro Bonfatti, Sottotenente Giuseppe Oblach, Sottotenente Alvaro Querci, Sergente Maggiore Enrico Dallari, Sergente Maggiore Sergio Stauble, Sergente Maggiore Antonio Valle and Sergente Santo Gino) and eight from the 96a Squadriglia to make a ground strafing against a British convoy in the Sollum-Buq-Buq area. While returning one Hurricane was attacked and claimed damaged, apparently by a 73a Squadriglia pilot. They returned to T3 at 17:05 claiming nine armoured vehicles (five in flames and four damaged). The following day, on 14 December, El Adem T3 was abandoned by the two Gruppi of the 4o Stormo because of the presence of British armoured cars in the surroundings of the airfield. The new base for the 9o and the 10o Gruppo was Derna N1. During the day the whole 4o Stormo was employed to attack the advancing British forces of Operation Compass. In several attacks more than 123 trucks, 31 armoured cars and 31 other vehicles were destroyed in this single day! On 16 December, the Stormo was transferred to Ain el Gazala T4 since N1 was overcrowded with men and aircraft. On 17 December, five SM 79 of the 15o Stormo under Tenente Medun took off from Z1 at 09:15 and attacked enemy ships that were bombarding Bardia, with 45 100kg bombs. Gladiators intercepted the Savoias and one of them was reputed shot down. They landed at 11:10. Their assailants were without doubt Gladiators from 112 Squadron, the unit’s ORB reported an offensive morning patrol by Squadron Leader Harry Brown, Flight Lieutenant R. J. Abrahams, Flight Lieutenant John Scoular, Flying Officer R. J. Bennett, Flying Officer Oliver Green, Flying Officer R. B. Whittington and Sergeant E. N. Woodward. The sketchy reconstructed ORB, however, lacks details of the engagement. The SM 79s were escorted by 13 CR.42s of the 9o Gruppo; three from the 97a Squadriglia (Capitano Antonio Larsimont Pergameni, Tenente Ezio Viglione Borghese and Sergente Maggiore Raffaele Novelli), four from the 73a Squadriglia (Tenente De Campo, Tenente Pietro Bonfatti, Tenente Giulio Reiner and Sergente Mario Guerci) and six from the 96a Squadriglia, which had taken off at 09:45. With them were two fighters from the 78a Squadriglia (Sottotenente Natale Cima and Sottotenente Dario Magnabosco) on the last mission of the campaign by the 2o Stormo. The identity of their opponents is not completely clear but it is known that during the day 33 Squadron was busy ground strafing the Bardia-Tobruk road and during these missions, one CR.42s was claimed in flames with one probable. Eight Hurricanes of 274 Squadron took off in the morning, starting at 06:16 to patrol the line between Bardia and Gambut. The engine of Pilot Officer Wilson’s Hurricane (P3720; the fighter usually allocated to the famous ‘Imshi’ Mason) caught fire and his mission of was suspended before takeoff, while N2627 failed to return, with Pilot Officer Strong force landing 30 miles west of Matruh. All the other pilots came back without seeing enemy aircraft. It is however possible that Strong was involved in the combat against the 9o and the 13o Gruppi. Tenente Valerio de Campo later retroactively promoted as Capitano as from 21 November 1940. He was awarded a Medaglia d’argento al valor militare. 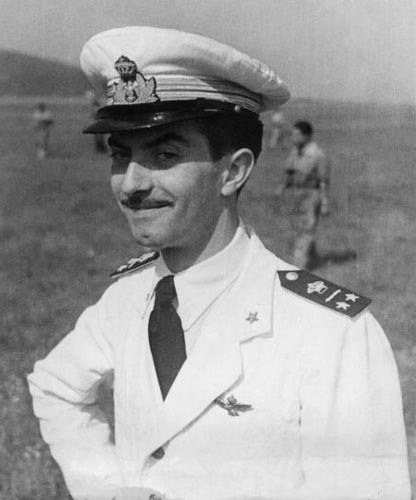 On 16 January 1941, Capitano De Campo was replaced by Tenente Pietro Bonfatti as CO of the 73a Squadriglia, 9o Gruppo. In 1942-1943, he was assigned to the Ufficio Tecnico Costruzioni Aeronautiche di Bologna (Technical Office of Aeronautics Constructions in Bologna). De Campo ended the war with 5 shared biplane victories. During the war, he was decorated with the Medaglia d’argento al valor militare, the Medaglia di bronzo al valor militare, the Croce al merito di Guerra, the Medaglia commemorativa della campagna di Spagna and the Medaglia di benemerenza per i volontari della guerra Spagna. He continued to serve in the Air Force after the war but left the service in 1948 with the rank of Maggiore. He moved to Turin with his family and started to work in the lumber business. In 1954, he started to import lumber to Italy. De Campo passed away in 1960 and is buried in the family tomb at Manzano cemetery. Biplane victories: 5 shared destroyed, 2 probably destroyed and 1 and 4 shared damaged. TOTAL: 5 shared destroyed, 2 probably destroyed and 1 and 4 shared damaged. (d) Claimed in combat with Gladiators from 3 RAAF Squadron, which claimed one SM 79 and one probable and two CR.42s for the loss of four Gladiators destroyed and one force-landed. The 9o Gruppo claimed six Gladiators and three probables for four Fiats damaged (one of them was lost). The SM 79s from the 60a Squadriglia claimed two Gladiators without losses (the CO was however killed). (e) Possibly claimed in combat with Hurricanes from 33 or 274 Squadron, which claimed one CR.42 and another probable while one Hurricane force-landed. The Italian fighters claimed two Hurricanes, one probable and two damaged while losing one CR.42 and getting a second damaged.